Two schools offer advanced degrees in typography and type design: the University of Reading, in the UK; and the Royal Academy of Art, in the Hague, the Netherlands. 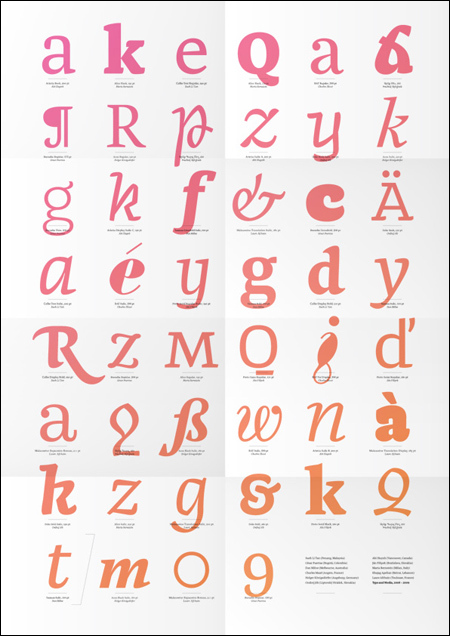 While there might be other schools that currently have, or are in the process of developing, programs in typography, these two are the oldest and best known. The University of Reading offers advanced degrees in Typography & Graphic Communication, as well as in Typeface Design. Their approach is a combination of practice, theory and history, with a distinguished staff that is complemented by visiting professionals and academics. Gerry Leonidas critiquing student work at the University of Reading. The Royal Academy of Art offers a postgraduate course in Type]Media (formerly titled Type Design and Typography). 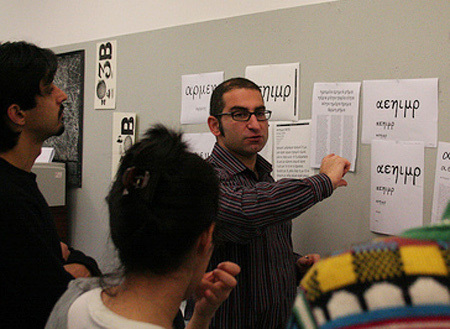 It is a full-time course that enables participants to delve deeply into type design for different media: not only for print, but also for film, television, video and interactive media. Group specimen poster for the Royal Academy of Art Type]Media Masters class, August 2009. According to Erik van Blokland, professor in type design, “The Type]Media course has a strong emphasis on drawing skills and a critical understanding of type technology, attracting students from all over the world. The small group (no more than 12 students per year) ensures the teaching faculty can give each student and project the time they deserve. The curriculum builds on the long history the Royal Academy has in type design, notably the theoretical work of Gerrit Noordzij, without making it a museum.” Check out their blog. If any of this interests you, check it out, and remember – it's never too late to go back to school, as many of the students in these programs are working professionals who bravely decided to take the plunge and follow their passion!